A report via the LA Times was floating around the internet yesterday that Twilight and The Twilight Saga: New Moon star Taylor Lautner was being weighed as an option to star in Paramount’s superhero teenager property, Max Steel. This didn’t take long to develop into a factual story as Deadline Hollywood was able to confirm with Paramount that they had indeed cast the 17-year-old Lautner for the lead. 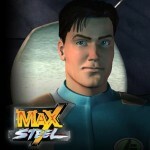 Max Steel originated as a CG-animated series that debuted in 2001 and went on to become an internationally popular toy line for Mattel, though it is not so well-known here in the states. And though it’s not the Transformers and G.I. Joe-level title that’s already making Paramount massive amounts of money, the studio is hoping that Lautner will rake in the majority of the planet’s female population and a strong percentage of the male population — for whatever reason might snag them. Steel tells the story of a 19-year-old X-Games-type athlete who is badly injured in an attack that sees millions of microscopic nanomachines known as Nano Tech Max infest his body and die, which in-turn eventually kills him. In order to save him, he is subjected to a heavy amount of special energy that revives the machines, saves his life, and gives him superhuman abilities. Paramount has hired the relatively unknown duo of J.P. Lavin and Chad Damiani to pen the script for the movie. None of their existing projects will ring a bell, but they do have two on the way in the form of Capeshooters and Youngblood that some may recognize. No word on when Max Steel may be seen, but it isn’t expected to be for a while.